I’m sure you’ve heard the story of the three little pigs. There was a house made of straw, a house made of sticks and a house made of bricks. When the wolf came to blow the houses down (and eat something tasty for dinner), it was only the brick house that stood its ground. The little pig that built the brick house had invested more money, time and effort than the other two. It proved to be well worth it. His house must have lasted for many more generations of little piggies. Then there is another story. 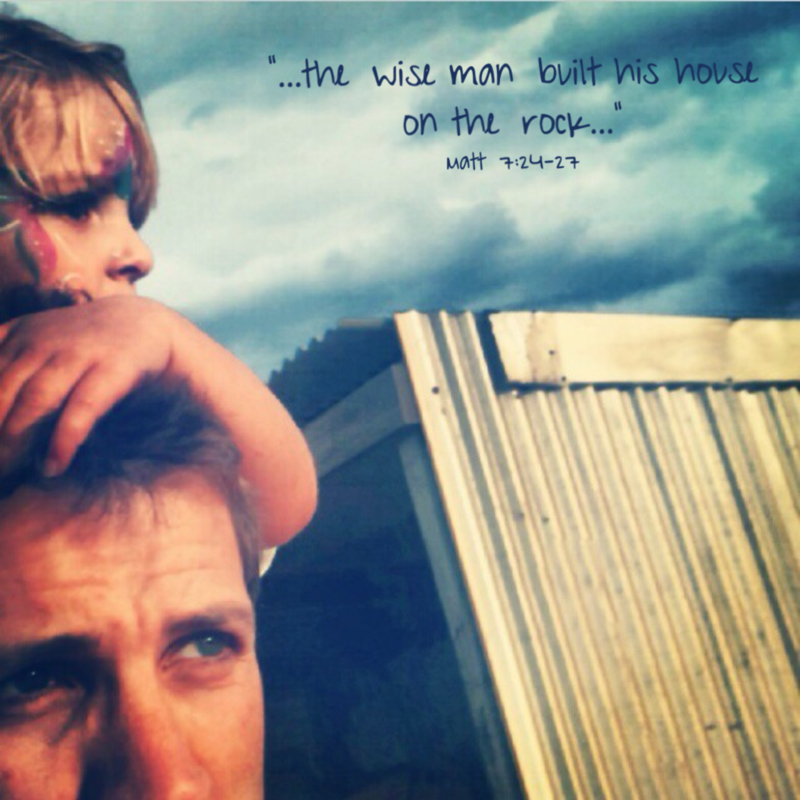 This one is about a wise man who built his house on rock, and another man who was not so wise and built his house on the sand. When storms hit and pummelled the houses, the one on the sand came crashing down. The house on the rock stood firm. A strong, well-built house, on a solid foundation, can last for many years. I’m no expert, but one only has to look at heritage buildings around the world to see that even if the walls and roof are scarred by the ravages of time, if the foundations and basic structure are solid, the integrity of the building is largely maintained. I wonder about the foundations and structure of my house, and that of my family. I don’t mean literally though. I’m talking about the house that is my life. Good foundations in our lives are grounded in our belief system and what we hold as important, which is revealed by how much time, energy and resources we devote to it. This then relates to our capacity to cope in the face of life’s storms. For some people, really strong, positive foundations are passed on generation after generation and lives of meaning and purpose are built and maintained with great confidence. For others, resilience has to be built from a much harder place. More groundwork has to be done, more hurt worked through. The terrible hardships that come along, depending on how we respond to them, may be used to grow and change a person. They then, can be the very catalyst for an extremely strong foundation and a life of determination and resolve. At some point in the journey, an individual may assess the foundations that have been passed on to them and actively reject or accept them. Even a person who has deep respect for the things their parents have passed on, still has to make the beliefs their own. They cannot ride complacently on the coattails of another. Also, we can hear things said over and over, but if we do not act upon them ourselves they can be quickly discarded and forgotten. How quickly do we forget even two generations before us? In the same way, strong beliefs that are not owned, loved and acted upon cannot remain strong in future generations. Sometimes I worry about my kids. I know I’m not alone in that. The storms of life will hit them whether I like it or not, and (I’m beginning to realise) much sooner than I anticipated. I cannot stop those storms rolling in and I cannot make the inappropriate, cruel or selfish things of this world disappear. I have hope however, that the foundations I choose to build my life upon will influence my children so that as they choose their own way and live their own journey they too may be able to stand strong. I pray for wisdom, strength and determination that I may cherish and build upon the good foundations that have been passed on to me. If I make them real in my life, and if that helps me stand firm like the house on the rock, then, like the investment of the piggy who could pass his brick house on to future generations of piggies, perhaps the investment I’ve made in the lives of my children will continue also.